Zürich’s charming Altstadt, which makes up a substantial part of the city centre, is packed with elegantly restored historic buildings as well as top-class shopping. In the distance, snowy mountains overlook the lake bordered by centuries-old mansions. You’ll find Swiss precision and eye for detail everywhere you go – even the so-called rougher areas of town are well kept by international standards. Today, Zürich is a cool, vibrant, multicultural place which maintains a modern, cosmopolitan elegance; something that the Swiss pull off to perfection. 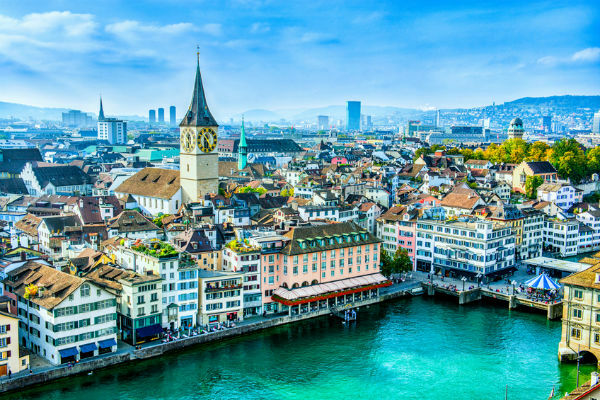 The Swiss culinary scene is also excellent and Zurich offers a brilliant range of dining options including several vegan and vegetarian restaurants. Solo women travellers are generally safe in Zurich and there are no no-go areas to speak of. If you would like to hook up with fellow travellers or locals to share some of the city’s wonders, meet up opportunities are plentiful. Zurich has been a world leader when it comes to gay and lesbian rights. Today, the city even has a lesbian mayor, Corine Mauch, reflecting its stance as one of the world’s most gay-friendly places. You will be spoiled for pubs, cafes, clubs and other gay venues, so feel free to express yourself. Backpackers enjoy using Zurich as an urban base for day excursions into the awesome Alps. Many people take day excursions to the snowy, ice-packed Jungfraujoch (Top of Europe) at 3,454 metres altitude. Year-round attractions include the Sphinx observation hall, the impressive Ice Palace and a hiking plateau within the glacier. You can also make your way to the highest railway station in Europe, take the ski lift and go on an exhilarating sled ride, pulled by a pack of huskies. Geneva is famed for many things: the UN’s European headquarters, magnificent Lake Geneva, the towering Jet d’Eau and the snow-capped peaks of the Jura Alps. Another Geneva accolade is its chicness; very little comes cheap so come with a healthy budget to enjoy sightseeing and shopping. If you yearn for some bargains, you could take a wander through the arty districts of Bains and Plainpalais with their quirky flea markets and galleries. Just like most things in Geneva, dining is generally quite a luxury event. Being such an international city, Geneva’s cuisine is diverse, especially if you are looking for haute-cuisine and innovative dining experiences. And for vegans and vegetarians, Geneva has a number of excellent vegetarian restaurants and stalls to choose from. If you are travelling solo in Geneva, women are perfectly safe, provided they take the usual precautions when visiting a city. Meet-up opportunities are numerous, enabling you to share your Geneva discovery with like-minded people, doing the things you enjoy the most. The LGBT community is well served in Geneva and if you would like to hook up with other like-minded people, there are meet-up groups for you too. Meanwhile, you will be spoilt for gay-friendly venues and events to enjoy in the city. Geneva’s closeness to the mountains opens up opportunities for all sorts of outdoor activities, including paragliding, climbing and hiking to snowboarding and skiing. Geneva lies within easy reach of some of the Alps’ best ski resorts like Gstaad, Crans-Montana and Zermatt, as well as famous Val d’Isère and Chamonix.